All over the country, people are paying attention to New York’s energy policy reforms as your administration works to make our state a leader in advancing renewable energy and efficiency. New York is gaining national recognition for the way our clean energy economy is growing rapidly with tens of thousands of new clean energy jobs. In alignment with the Reforming the Energy Vision, the Clean Energy Fund, and Community Solar policies, the proposed Clean Energy Standard (CES) should help this clean energy economy grow exponentially. But we, the undersigned 112 organizations, are disappointed that the proposed CES policy also includes an estimated $3.5 billion subsidy for unprofitable nuclear reactors. As ratepayers and representatives of ratepayers, we do not support the uncompetitive bailout of nuclear owners at the expense of the environment and public health and safety. The proposed nuclear bailout in the CES contradicts your leadership on issues ranging from climate change, energy affordability, and the closure of Indian Point. New York should not take the nationally unprecedented step of including nuclear energy in its clean energy portfolio. Nuclear energy is dangerous, costly, and dirty. Additionally, the unprofitable upstate nuclear reactors are not needed to maintain the reliability of the grid, they are not needed to achieve our climate goals, and they are not the best way to support jobs in upstate New York. In a report from this year titled “Generator Deactivation Assessment James A. FitzPatrick Nuclear Generating Facility,” the New York State Independent System Operator (NYISO) found that both FitzPatrick and Ginna nuclear reactors can close, even while coal and gas plants also close in New York, with no threat to the reliability of the electricity system. Thus, it makes sense to take money that would have gone to propping up nuclear plants and to instead invest in accelerating the transition to renewables. Subsidizing old nuclear plants is not the best use of our resources to combat climate change. Nuclear power is responsible for plenty of greenhouse gas emissions, particularly in the mining and enrichment stages for nuclear fuel. Furthermore, most of the upstate nuclear reactors will be closing before 2030, so they will have to be replaced to meet the state’s greenhouse gas reduction goals. Again, it makes sense to invest in renewable energy and efficiency now to replace those reactors, instead of wasting consumer money on temporary bailouts. Last year the Alliance for a Green Economy (AGREE) and the Nuclear Information and Resource Service (NIRS) published a report on a transition plan for FitzPatrick. It showed how we could transition FitzPatrick’s workforce and local economy for less cost than subsidizing the nuclear power plant. The report complements the extensive comments that AGREE and NIRS have submitted in the CES case showing how New York can meet and even exceed its greenhouse gas emissions targets without nuclear power. All of this is consistent with the federal Environmental Protection Agency’s determination that it is not the best use of resources for states to subsidize unprofitable nuclear plants to meet the Clean Power Plan goals. We understand that your administration is concerned about job losses in upstate New York if nuclear reactors close. Instead of supporting nuclear subsidies, we respectfully request a nuclear decommissioning and just transition process that will protect the environment, retrain workers, and provide a smooth path for nuclear-reliant communities to benefit from the clean energy economy. We urge your administration to fight for a decommissioning process that begins immediately to clean up and isolate the dangerous radioactive materials at New York’s nuclear sites. Doing so could preserve at least half of the nuclear workforce, and would ensure that the billions of dollars already set aside for decommissioning in New York starts getting pumped into local economies. Workers not employed for decommissioning should be supported through retraining programs and transitional wage support. We are eager to work with your administration on these efforts. We know we can revitalize upstate NY with clean energy jobs. Your administration is proving it. In addition to the 8,000 solar installation jobs in New York, green manufacturing is coming online. For example, the planned Solar City factory in Buffalo, the 1366 Technologies factory near Rochester, and the Soraa LED lightbulb factory in Syracuse will collectively create approximately 6,420 long-term jobs. The state investment in these facilities will be approximately $937 million. By comparison, the nuclear subsidies in the CES could cost over $3.5 billion to preserve fewer than 2,500 nuclear jobs. Municipalities and school districts that currently rely on nuclear tax revenues will also need help. Your administration has already shown leadership on this front by signing a State Budget that includes $30 million to replace tax revenue for municipalities and school districts going through plant closures. We are counting on you to protect our public health and the health of vulnerable communities throughout the nuclear fuel chain. The Public Service Commission has referred to nuclear energy as “clean,” as “zero-emissions,” and as “carbon-free” – none of which are true. The uranium mining and enrichment for nuclear fuel creates 1 billion pounds of radioactive mining waste per reactor per year, and is an industrial process responsible for large amounts of carbon emissions. Each nuclear reactor is allowed to emit a “legal” level of radiation that would cause 1 death per every 286 people exposed. Nuclear plants also create tons of nuclear waste, a problem that your own administration has challenged the federal government about because there is no long-term storage solution in sight. Meanwhile, the risk of a catastrophic nuclear accident continues at all nuclear reactors, including those in upstate New York. All of the plants in Oswego lack a viable containment to fully protect the public in the case of a meltdown, a fact that the Nuclear Regulatory Commission’s post-Fukushima Japan Lessons Learned Near-Term Task Force acknowledges, but has failed to fully fix. For all of the reasons stated above, we oppose subsidies for unprofitable nuclear power plants. We appreciate your efforts to make New York a leader in renewable energy and green economic development. 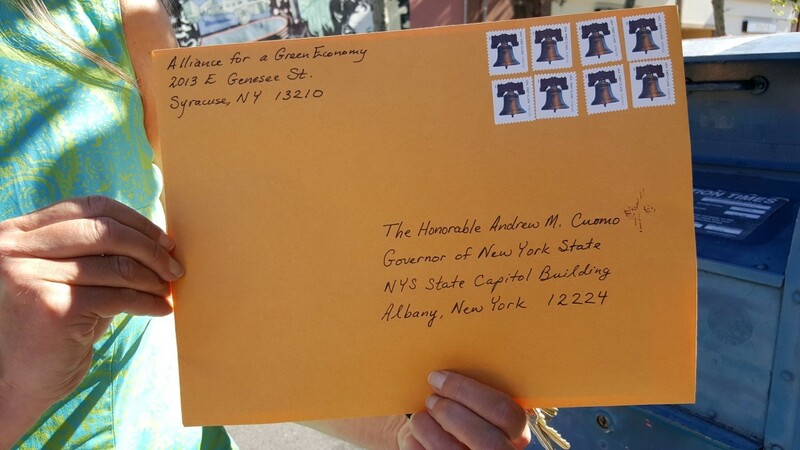 We ask that you extend this leadership to include opposing the proposed nuclear subsidies so that New York demonstrates to the nation how we can close all dirty and dangerous energy sources. Environmental Justice Task Force of the WNY Peace Center, Inc.